Lyanne Dubon-Aguilar is a designer and creative director specializing in brand identity at Etsy in Brooklyn, NY. At Etsy, she leads a team of designers in creating brand experiences that foster creativity, community, and Etsy’s mission to Keep Commerce Human. 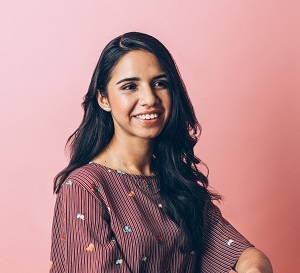 Her projects include the launch of Etsy Studio, the Etsy IPO, and Etsy Wholesale.Originally from Tegucigalpa, Honduras, Lyanne has worked across a range of disciplines for The Museum of Modern Art, Pentagram, and Local Projects. Lyanne holds a B.F.A. in Graphic Design from The School of Visual Arts where she taught as an adjunct faculty member from 2014–2017.